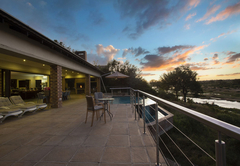 Buffalo Brooke is a 5 star graded property offering Hectorspruit accommodation for up to 10 guests. Buffalo Brooke is located in the Mjejane Game Reserve in the Kruger National Park. 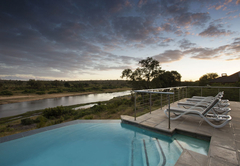 Buffalo Brooke is perched on the scenic banks of one of the Kruger National Park's greatest rivers - the Crocodile River - and is surrounded by tens of thousands of hectares of raw African wilderness. 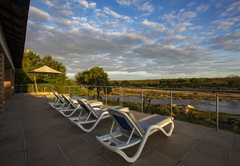 Contact us for a quote in order to experience Africa at it’s very best. 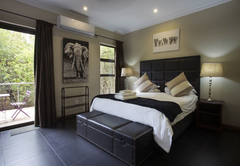 Buffalo Brooke accommodates ten guests in five private bedrooms. 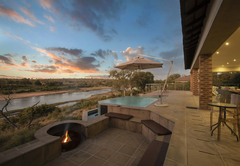 Every bedroom has an en-suite bathroom with bath, plus an inside and outside shower along with a patio looking onto the Crocodile River. 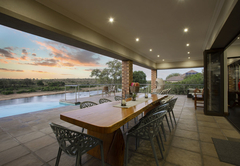 The long passage of the house opens up to a large lounge and dining room area where visitors can enjoy a sunset drink while watching a variety of bird and animal life. 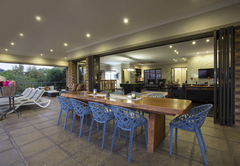 This room further extends to an enormous patio with an infinity pool and braai area where many a bush story has been shared. This 5 star house has air conditioning, ceiling fans, Wi-Fi, PVR satellite TV, a fully equipped kitchen and bar along with maid service daily. Here you will observe raw Africa in all its magnificence and its many moods. Buffalo Brooke is Big 5 territory and as the sun sets over the Kruger National Park at the end of another remarkable day the river will carry your cares away and Africa will be in your blood ... forever. 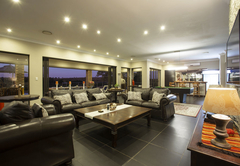 • 5 Bedrooms - 3 with double bed, 2 with twin beds. 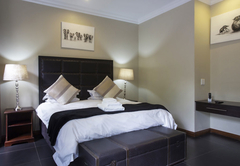 • All bedrooms have en-suite bathrooms with bath, inside shower and outside shower. 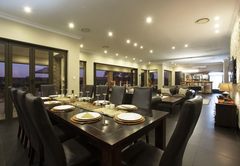 • Self-catering with restaurant option on property (only by arrangement). • Air-conditioning and Ceiling Fans. 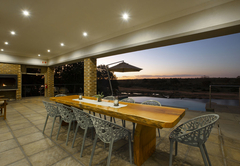 • Fully Equipped Kitchen and braai area. 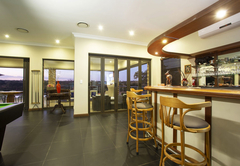 • Bar, lounge and dining room. • Satellite TV with PVR Decoder and surround sound. • Linen and towels supplied. • Washing machine, tumble dryer and dishwasher available for private use. • House is inside the Kruger National Park but self-driving is not an option. 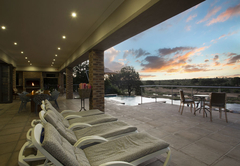 • Big 5 viewing from Pool and Deck. • Game drives available with private land rover and ranger. • Bush Walks can be arranged. 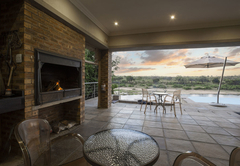 • Entry into Kruger Main over private bridge with SUV or 4x4 only (Separate fees apply). Booking essential. • Self-drive option – exit Mjejane Reserve and enter at Crocodile Bridge (45 mins away) or at Malelane Gate (30 mins away). • Check in after 14h00 and Check out before 10h00. 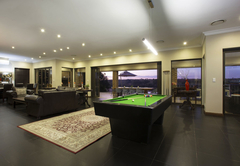 • House is within a secure fence and security is provided. 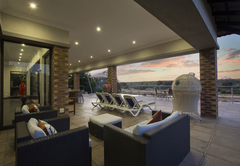 Three excellent golf courses (Malelane Country Club, Leopard Creek in Malelane and Kambaku in Komatipoort) are situated within 15 to 30 minutes from the entrance to Mjejane Game Reserve and a fourth, at Skukuza, is within an easy drive through the Park. 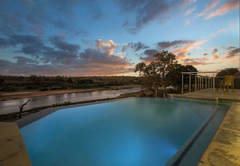 Tiger-fishing in the Komati River is within 30 minutes and elephant-back safaris and microlight flights are offered a mere 15 minutes from the reserve. Stocking up on supplies is very easy as both Malelane and Komatipoort offer a host of shops, medical facilities and the like. 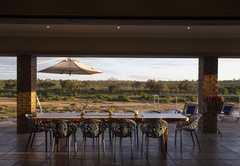 Day outings to both Swaziland and Mozambique are within easy striking distance from Mjejane Game Reserve. 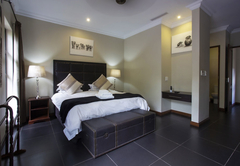 5 en-suite bedrooms with bath and shower plus outside shower. 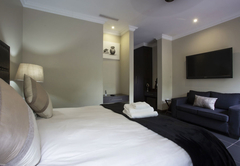 Every room has air-conditioning and ceiling fans as well as a private balcony. 3 Double bedrooms and 2 with single beds. 5 Star accommodation. I would like to say a huge thank to yourself and Bianka for the most wonderful week we all had at Buffalo Brooke. It was truly amazing and we all enjoyed ourselves immensely – we will definitely be back… Thank you once again. We spent 7 days in Buffalo Brooke and were sorry to leave the really well equipped luxurious lodge. The service is spot on and the staff friendly and helpful. It was a wonderful peaceful and relaxing holiday. We saw many animals coming down to the river to drink - Sept still being the dry season. We had a small herd of about 6 buffalo on our side of the river lazying in the bushes just below the house. An elephant also crossed over the river to graze on our side. There were many hippos with their young as well as crocodiles basking in the sun. We went on a game drive in Mjejane and were able to take super photos of Buffalo as our guide Muntu parked us right in the middle of a herd - awesome! On this drive we also were able to take pictures of a lone cheetah sitting in the shade of a tree. We also visited a dam which literally came alive when the hippo swam off - there we just so many of them. Altogether a really great holiday with unforgettable memories.